What a busy and great weekend! Our babysitter, Sara, went away to college this year but she was home for a long weekend. We begged and pleaded with her (really, we just asked) to hang out with the kids on Friday night and she said yes. Curtis and I went to dinner at Ouisie's Table and ate on the patio. It was such a nice evening and we were actually a bit chilly out there even with our sweaters on. Praise the Lord and amen. We were pretty stuffed but didn't want our date to end, so we had dessert at Crescent City Beignets. Yum! Late Saturday afternoon our church hosted a fall festival, AKA First Fest. We have traditionally had this on Halloween night, but we have a Sunday night service so things got shuffled around this year. Here are the kids before we left for the church. 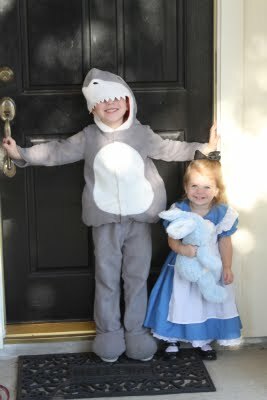 Annabeth was Alice in Wonderland and Jackson was a shark. 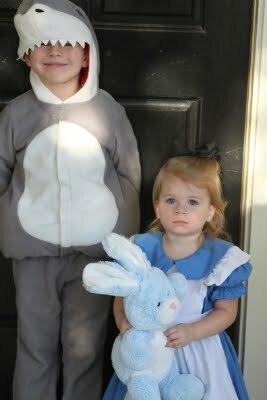 Annabeth adores her big brother, as you can see. The preschool choir had their first performance at First Fest. 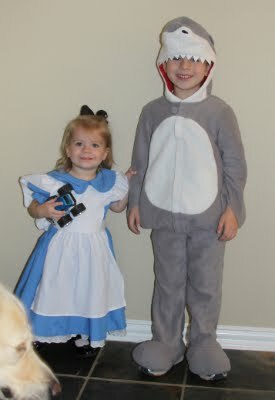 The kids were hilarious singing in their costumes. It was a lot of fun to watch. Jackson seemed a little distressed when he sat down on the risers. Annabeth was SO GOOD! Lately we have spent a lot of time banished in the car while big brother and daddy do their thing, but not this weekend. I did not bring her a snack but when we opened up the stroller there was a bag of Cheerios. I really think the Lord put those there for us because they got her through the choir extravaganza. This is Avonlea Smith, AKA Little Red Riding Hood, who was born just 2 weeks after Annabeth. I had to get a picture of Red and Alice looking cute in their strollers. This is my dear friend, Christine, and her little girl Preslee. 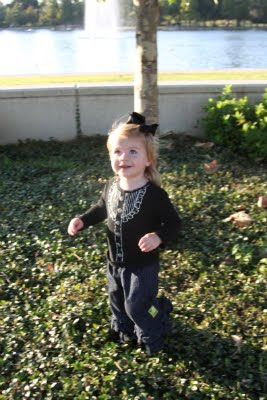 Many of you bought t-shirts that helped Christine and her hubby raise money for Preslee's adoption. Isn't she the cutest thing ever? Thank you for blessing this wonderful family. They are in the process of starting a non-profit to help other families who are adopting. Isn't that awesome? This is the first picture we have together with our girls. 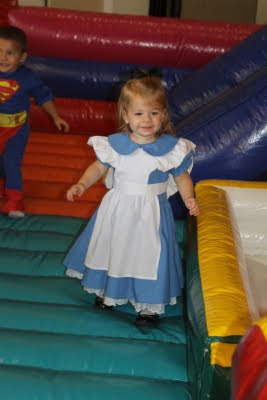 Annabeth did not let her big dress stop her from having fun in a bounce house. 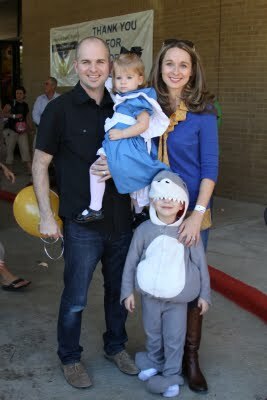 This is Amber, one our preschool staff members, and Joey dressed as Pastor Gregg and Kelly. So stinking funny. Family portrait. We left shortly after and headed to Chickfila. I hadn't eaten there in at least two weeks, which is unheard of. Late last night a bunch of us girls went to see a movie. I love having friends who will do random things at the last minute. For tonight, our pastor encouraged everyone to "light the night" in their homes. So we did! We turned on all the lights in our house and got ready to love our neighbors. I swept the porch and got rid of the topiary that has gotten old and gross. I put out my little red table and it looked great. But I would really miss it inside so I moved it back in tonight. These two are my loves. As soon as we came inside from our photo session, AB poured a glass of water on herself. By the time we went out, she also had chocolate on her dress. This pic of Abe makes me laugh. She looks like a very intense prairie woman. That Alice dress could be many things. I had her carry a rabbit so it would be more obvious. Mom flew in from her conference in Spokane, WA, and came straight to our house. I had begged her to come over and do this with us. 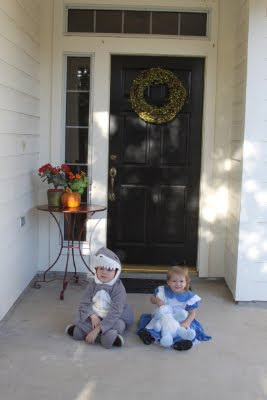 (We didn't trick-or-treat growing up.) She wasn't very comfortable with the idea at first, but once she heard our pastor asking us to light the night, she got on board. 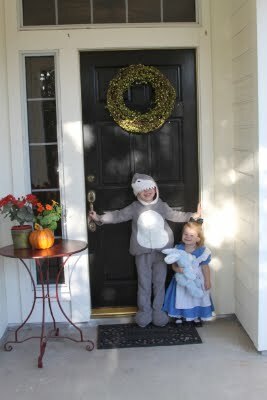 She and Annabeth manned our porch with the candy while we went along our street with Jackson. We met so many neighbors. After 2.5 years I'm very glad to know some more names. Mom met a couple of ladies who did her Bible studies, so that's fun. Although I think she felt compelled to explain why she was doing this. Bless your heart, Mom! I love you so much! 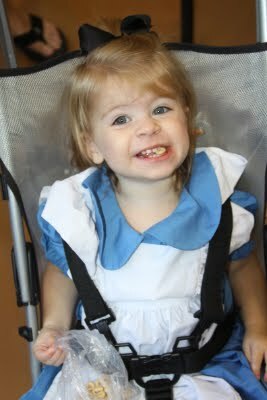 By the way, Annabeth really enjoyed putting the candy in all the kids' bags. I think she may have helped unwrap a few things before dropping them in. Oops. Some church friends in the neighborhood - Jenn, Nathan and Peyton - stopped by to say hello. It was fun hanging out on the porch with them. It was a nice evening even though I was burning up in that sweater (which is cuter in person!) and Jackson was sweating profusely in his fleece costume. 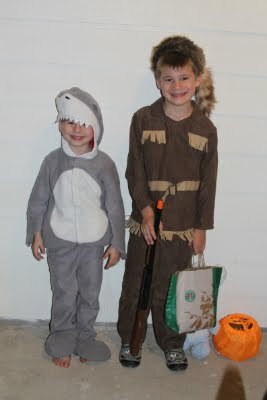 Shark boy and Davy Crockett. We capped off the night with some Chinese food and then we watched a video of Jackson's choir performance. The best part of the whole weekend was watching Jackson watch himself. His whole body was shaking with excitement and he could not contain his glee. He giggled and laughed without restraint for the first five minutes. We actually tried to record that, thinking we could send it to AFV, but he stopped as soon as Curt got out the camera. Blast! Curtis is asleep beside me and I'm sure he'd appreciate it if I'd stop typing. So goodnight! When we wake up it will be November. All I can say is we survived the day - a day in which my daughter was trying her hardest to make me have to take her to the ER for stitches or a broken bone or something. Her other goal was to send her mother to a special home for women who used to be sane but went insane while mothering small children. At about 11 a.m. I asked Curtis to make a reservation for me in one such home. But here I am in my living room and I survived the day. And so did the rest of the Joneses. This morning I took the kids to a Learning Express toy store, where a friend of mine was doing a book signing for her first children's book. We showed up early for the story time in which the book was going to be read. It was a risky move. The Joneses have never really been story time people. The last story time we went to was when Jackson was 22 months old and we were at First Irving's preschool Christmas extravaganza. The fun day was capped off by story time in the library. Everything in me was going "Run! Run for your life!" but I didn't want to be rude. So we stayed. And my son did not stop moving the entire time. In fact, he grabbed a book off the shelf next to him and started flipping through it. We didn't really pay attention to the book because (A) we were in the church library and (B) we were listening to Mrs. Donna read her book. A couple minutes later we realized Jackson had chosen a book from the 1970's that teaches older kids about their anatomy. Awesome. We are the awesome parents who didn't realize their toddler was flipping through a book with huge anatomically correct diagrams. So, story time 2010. I was not dumb enough to let Annabeth off my hip in a toy store with multi-level displays, which meant that I actually held her for 30 minutes straight. But Jackson got to sit on the floor like a big, mature 4.5-year-old. He listened politely but I know he was mostly thinking about all the toys filling his vision that his mommy had told him not to ask for. I would have felt bad for him if we hadn't been in that very store a week ago (because I had the date wrong for the book signing, of course) and bought him three toys and none for his sister who didn't care. She just likes to throw things these days. After story time the kids "got their sillies out." The kids got to get up and do silly moves and be childlike. To my surprise, I looked down and saw my child sitting on the floor with his face in his hands. Pouting. Have I mentioned that several of my friends from growing up were there seeing this? Well, they were. And I shouldn't have cared, but I did. A few minutes later we bought two copies of the book - one for me and one for a giveaway I'd like to do - and lined up to have them signed. My sweet friend, Erica, got up from the table and asked her mom to take our picture. At that moment my son completely turned his back to the camera, so as to avoid being photographed. We left right away. Is anyone else experiencing this kind of attitude from their preschooler? His recent interactions with adults and other kids have STUNK. So far I'm not aware of any problems at school or at church. This is happening repeatedly in my presence. Last night, we walked into my parents' house and the first thing he did was rudely say to my dad, "Why did you eat all my animal cookies?" And scowled. Y'all! What in the world? He was in so much trouble. I'm just at a loss. My mom gave me really encouraging pep talk today about Jackson's world getting so much bigger recently with new things like soccer and choir. She said his little psyche needs time to catch up to the size of this world. That makes sense to me. But dealing with these heart and attitude issues is so hard. Curtis and I have been asking ourselves what we did to mess up our friendly kid. The only bright side is that maybe the Lord is giving him a keen awareness of his sin nature so he can come to repentance and put his faith in Christ. Maybe? Then there's Annabeth, that sweet, sweet girl of mine. So precious with her big blue eyes, wide grin, and gooey boogs in her long bangs. Meal times have been nightmarish lately. Wait, do I want to call meal times nightmarish or save that word for any time I change her diaper or dress her? All are equally nightmarish. Meal times are a combination of violently throwing food, cups and silverware (such as the fork that was aimed at Jackson's head today) and the tantrum that ensues when I take away her plate for this bad behavior. Sometimes I ignore the throwing. I haven't figured out which one works because clearly neither tactic is working. Help me, Jesus. Have you ever put a diaper on a cat? I'm guessing not. I feel sure it is somewhat like diapering Annabeth. My blood pressure goes up at the smell of anything bad because I know what's coming. It's such a battle. And yesterday when I was trying to get her dressed and her hair done for church, we ended up wrestling on our backs on the floor. It literally caused perspiration. By the time I got to Sunday school I just went straight to a chair and sat down. I had no energy to smile or initiate conversations. This stage of parenting is so stinking hard. So today Annabeth appeared to want to visit the ER, based on her refusal to quit climbing everything in sight. In the four o'clock hour, she fell off my bed, nearly fell off our netted trampoline, and pulled Jackson's Leapster off the counter top in such a way that it smacked into her forehead. Now she has a new bruise to add to the one next to it that was finally starting to fade. I think more than anything, me and all the moms who are raising little kids want to be validated. Even though our children are adorable, and even though we will look back on these years with longing and tremendous fondness, and even though we love our kids with all our hears, it is really hard. We are physically exhausted from lifting them, cleaning up after them, cooking for them, carting them everywhere we go, bathing them, and being available every waking and non-waking moment. We are emotionally drained from being consistent with our discipline and listening to the sibling feuds. We are worried that we aren't doing a good job and discouraged because we compare ourselves to other moms who are more creative or put together or organized or resourceful. Older women, please pray for us. Please pray for my friends who take their children to physical, occupational, and speech therapy multiple times a week. Please pray for my friend B who found out this year that her son has autism. Please pray for another friend whose beautiful son has limb differences. Please pray for my friend K, a mother of two little ones, who has been sick for a month. 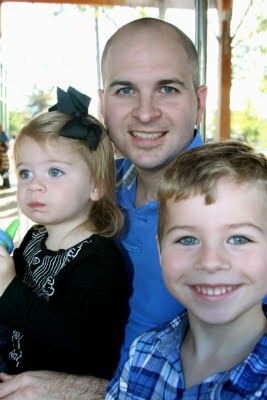 Please pray for my friends J and C who are getting ready to add to their families by adopting through foster care. Please pray for my friends whose husbands work very long hours or travel all the time. Please pray for my friends who haven't been blessed with children yet and would trade their set of frustrations and exhaustion for mine. And yes, even after all that I have written, I mean it when I say "blessed with children." I am blessed. I did not want to read it. So much is being said about Radical that my flesh was rising up and saying, "I will not read it." Aside from my you can't make me attitude, the things people said about Radical scared me. This blog is where I first heard of it. If you take a few minutes to read it, you can see how the writer and her family have been impacted. See? Scary. The video promo I just happened to see for this book and lecture series made me want to hide under a chair. "Curtis," I would ask, "Is this guy saying that you have to take a vow of poverty to be Christian? Or that you have to move overseas to please God?" This is how I interpreted what I was hearing. My heart was agitated to the point that I knew I had to see what David Platt had to say for myself. If a book was becoming this widely talked about, at the very least, I needed to know what it said. So about a month ago I went into LifeWay to buy Francine Rivers' new novel. And I saw Radical. It's bright orange - how could I miss it? I grabbed it before I could talk myself out of it. I read the novel first. Then I had nothing else standing in my way and it was time! To be radical! I am not going to endeavor to tell you everything I learned in that book. But what I want to say is that instead of this message putting a heavy yoke on my shoulders as I feared, chains fell off my soul and I felt free. In the beginning of 2010, Curtis and I started feeling dissatisfied with our life. We had not set out to live the American Dream, but lo, we were! We have a cute house in a well manicured neighborhood, drive SUV's, have two beautiful kids and a golden retriever. If the American Dream + Jesus could fulfill you, we would lack absolutely nothing. But I remember Curtis saying that at age 20, if he would have guessed what his life would look like by age 30, this would not be it. Our life was too normal. This is not what we meant to do. This year has been a very intense journey in many ways, much of which I have not been able to write about. We do not know, understand or always like what God has been doing in us, but at least we know He has been working! Thank You, Lord, that You do not leave us as we are, even though we often want You to. I'm so thankful that God put this book in my hands, even when I acted like a child about reading it. Remember Super Mario Brothers? This has been like when Mario gets the mushroom and becomes adult-sized so he can pulverize bricks standing in his way. God has strengthened my "Yes" and loosened the chains of fear and greed. I would like to say that He completely set me free but this will probably be a lifelong process for me. At this point you may be wondering what David Platt is really saying in Radical. And if so, then you're just going to have to read it for yourself! Last week I got to go to Catalyst with my mom. I've always wanted to attend that conference and I was so excited that my mom was invited to speak at it. I was hesitant to leave my family again but Curt encouraged me to go. (I'm staying put for a while!) The conference was held in Atlanta, where my sister lives, and I couldn't wait to see her. When we got to the event center we went to the green room for a little while. 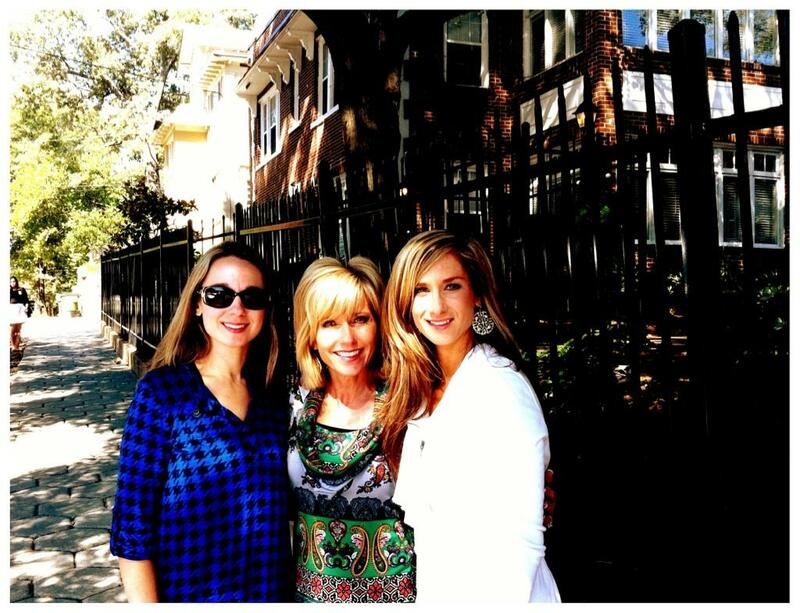 I got to meet several of my sister's Atlanta friends, including the beautiful Heather Whittaker and her fun family. I also met Brandi Wilson, Lori Wilhite, and Jessica Cornelius, who are all pastor's wives and have an online ministry called Leading and Loving it. They were such neat women. I saw one of these guys with a bowl cut and I had no idea it was to be funny. I was just thinking "What in the world is wrong with that guy?" Ha! I also got to see the lovely Lindsey Nobles, who is one of my buddies from the Guatemala trip. She was looking like a total hottie in her heels and cute hair cut. We laughed about how much better we looked than on our trip and agreed that this is what we really look like. Amen. Don't judge unless you've been in a developing country recently. It was great meeting Lindsey's friend and hotel roomie, Bianca Juarez. I've enjoyed getting to know her on Twitter and through her blog recently. Mom's turn to speak came quickly. First, Kari Jobe led two songs - "Healer" and "Revelation Song." What a blessing it was to hear her sing. I recently went through a very difficult time and I could hardly reconcile all of that with the fact that I was now standing in that place with a sea of people worshipping God. It was overwhelming, but in a good way. I thought Mom did a great job speaking on insecurity in ministry. Melissa and I were so proud of her. Afterward I got to meet Jon Acuff very briefly and he chatted with Mom for a while. If you are not reading his blog yet (where have you been? ), it's a lot of fun and you especially need to check out his Wednesday posts. They seriously preach. We left a few minutes later and missed Francis Chan's talk, which I heard was amazing. In fact, I tried to download it a few days ago for $2.99 - and even linked to it on Twitter - and Curtis clued me in to the fact that it was the one from three years ago. Awesome! Only me! Well, it was still a great talk. Sorry if you're one of the ones I led astray. I hope that Curtis and I will get to attend Catalyst together next year. I was only there for the tiniest bit of it but I would love to get the full experience sometime. We got to meet lots of attendees in the hotel (we even saw my aunt and uncle!) and everyone was so kind and gracious. It would have been neat to hear everyone's story. If I can be honest, I thought this conference would be way too cool. Everything I heard about it online made it seem that way. But I walked away feeling very blessed by the genuineness of the leaders and attendees I encountered. Melissa took us to The Melting Pot for dinner and we celebrated our togetherness with fondue. After lots and lots and lots and lots of eating, we went back to the hotel and crashed. Melissa stayed in my room with me, so it was a slumber party. The next morning we drove to a part of town where you can walk around to all sorts of fun shops. Our first stop was a place called Belly that has homemade bagels. Praise the Lord. Apparently parts of the new Katherine Heigl movie were filmed there. It was super cute. Our friend Janet met up with us for lunch and shopping. Mom treated each of us to a few fun things. Melissa and Janet bought the same sweater, so they're going go to have to coordinate when they wear it! They day flew by and soon we were in a taxi cab heading to the airport. I sat by a woman on the plane who ended up being my brother-in-law's co-worker. What a small world. I enjoyed visiting with her. She and the guy on the other side of me slept most of the way, which is good because I was reading the end of Radical and crying like a baby. And that is a story for another day. PS - Thank you to everyone who donated money for Aid Sudan's hand-held radios. Y'all are awesome! Yesterday the executive director of Aid Sudan, Peter Swann, came to talk to our Sunday school class about an amazing opportunity. I do not know Peter personally, but I can tell you based on his reputation in our church that he is the real deal. A couple of our class members are on the board of directors of this ministry and one of my dear friends is on their staff. Anyway, this is so cool! They are having an October campaign to put solar powered, hand-held radios in the hands of men and women in southern Sudan. These radios can only tune in to one station, and what they hear on this one station is local pastors proclaiming the word of God in their own language. How awesome is that? (They will also hear health and hygiene info, local and international news, and community development info.) Groups of 10-15 people will gather around these radios and listen. And the radios last for 12 years! Peter used to live in Sudan and he said there is no ambient noise there. So when people hear the radio, they are drawn to it. The maker of these radios is subsidizing the cost for Aid Sudan and they are only $20. Twenty dollars to share the Gospel with people in southern Sudan! How could I not share this with you? Check out these videos and if you are as moved as I am, buy a radio and pass on the news! I am going to attempt to recap our week. It will be boring, but I'll have fun reading it next year and seeing what we were up to. Curtis and I were given tickets to see Amy Grant in concert at the Hobby Center. She is on the Pieces of Our Lives tour with Compassion, which was designed to benefit the Leadership Development Program. Amy Grant was fabulous and I loved hearing her sing old and new favorites. Four other things about the night were also fabulous. One, our tickets had us in the center of the third row. They were the best seats in the house if you ask me. Two, we got to dress up, which is always fun. Three, it was a very intimate setting in a room that only held 300 people. Amy told stories in between her songs and talked to us like we were all friends. It was so neat. Also? She is really funny. Four, a former LDP student from Kenya named Ben shared his testimony. I wish we could have taken him to dinner and heard more of his story. If you are in a financial tier that would allow you to give $300 a month, please pray about sponsoring a college age Compassion student. (Groups can also pull their resources together to sponsor LDP students.) Only the top 20 students from each country who demonstrate academic excellence get to enroll in this program each year. These students go on to be leaders in their countries and mentors to the next generation. What a worthy investment! Thanks to Shaun Groves and Brian Seay for treating us to such a special night. I was wiped out. I stayed at home and read my Francine Rivers novel - Her Daughter's Dream - while the kids were at school. It was very good. 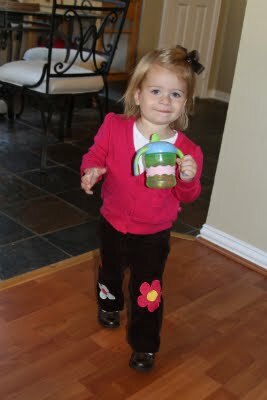 Annabeth and I stayed home from church because she wasn't feeling well. I'd let the house go for several days and I spent the evening cleaning. Woo hoo! The kids had a fun run at their school. Annabeth's class was pushed in a buggy. Can you imagine what it would be like to try to get toddlers to run in any semblance of order? I went up there in time to see the preschoolers run and it was the funniest thing I've ever seen in my life. I was a hole puncher, so I had to grab as many kids as I could at the end of each lap and punch a hole in their little name tag. By the end, all the kids were coughing and red-faced because they were running so hard. Bless their hearts! They seemed to love it and the atmosphere was very fun. There was loud music and pom poms and lots of cheering. I'm sad that this was the first time I attended this event and it was also the last one for Jackson. After that, I had lunch with Heather and Mollie at The Bake Shop, which is right down the road from LPM. They are famous for a little wonder called the ding dong cake. I got two to go. That night, Kay and Jerrell came over to hang out for a bit and we broke into the desserts. Jerrell rededicated his life to the Lord because he was so inspired by it. Curtis turned up his nose at it, so I ate his half the next day. His loss, my gain! Curtis left town to speak at a youth event in Kentucky. He was really excited to be able to do that. I was a little bummed because my mom was also going out of town, but what can you do? I have been gone so much lately that I knew I needed to buck up and take it like a woman. 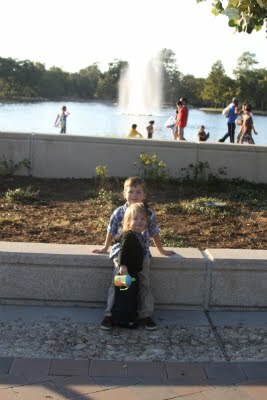 The kids and I went to a park. I'm not a fan of playgrounds, but it was fine. There was a little girl who repeatedly begged my son to chase her, and when he did she went screaming to her mother. Fun times. Later we went to the pediatrician for preventive flu measures. We made it out in one piece and I was very proud of us. The kids and I drove out to the TGR Exotics pumpkin patch in Spring. I randomly found it by searching online for pumpkin patches in the area. I wanted to go to Dewberry Farms, as we have for the last two years, but I didn't think it would be wise to try such a crowded place without Curtis. TGR seemed like it would be a laid back experience and the web site said we could make scarecrows. Isn't that fun? We had the best time. It was just a very relaxed day on a farm with some pumpkins. The kids played with shovels in a corn-filled trough and Jackson painted a small pumpkin. The last thing we did was make a scarecrow. (FYI, this was the only weekend for the scarecrow project.) The owner, Gwen, who was as sweet and engaging as she could be, sat down with us for at least 20 minutes and helped us make it. She had the head already made and I had to draw a face on it. Bless its heart. Then we got to pick out the clothes and scarecrow accessories. Finally, we went to town stuffing hay into the thing, which left me itchy for the rest of the day. But it was worth it! It was the highlight of our weekend. I am the opposite of crafty and I never would have done this on my own. Our scarecrow is hanging out in my office right now until I can figure out how to arrange him outside. Jackson named him Scary Uncle Lou Scarecrow. According to my child, Scary Uncle Lou protects all the worms in the ground from the birds so that he can play with them. One such worm is "Clumsy, the world's bravest worm." You're welcome for that. On Saturday evening, I made spaghetti and meatballs. I was so proud of myself for cooking while Curt was gone but it didn't turn out very good due to a current lack of pepper in my kitchen. Oh well. After that we visited our sweet babysitter, Sara, who is home from college for fall break. She imported some cookies for us from JD's Chippery in Dallas. Praise the Lord. On the way home we had to get milk at HEB and this was definitely the low point of the weekend. It was so crowded and my son was beyond hyper. I probably would have ended the day feeling like super mom, but I was not proud of how I handled things between us at the store. And I never showered. Sweet mercy, my husband came home late this morning! We had lunch together Berryhill and then I got Annabeth some fall clothes at Baby Gap, where everything was on sale for 25% off. Tonight we picked up my mom and went to the evening church service. Pastor Gregg preached a great sermon on Jesus's first miracle at the wedding in Cana. You should be able to watch it here if you'd like to. In conclusion, I'd just like to say THANK GOD IT'S OCTOBER!